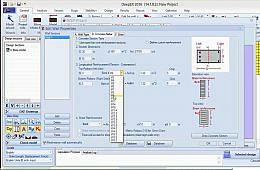 DeepEX is a software program for the design of embedded earth retaining walls with limit-equilibrium and advanced non linear elastoplastic analysis methods. DeepEX offers a one-stop complete geotechnical and structural solution for deep excavation. DeepEX captures realistic soil behaviour by simulating the soil-wall interaction with advanced models that consider soil stratigraphy, initial stress state and including different behaviour and failure criteria during virgin loading or unloading-reloading. The software provides a complete database of materials and wall sections (sheet piles, diagraphgm walls, soldier piles, etc. ), ground anchors, steel braces (struts) and concrete floor slabs. All design approaches required by Eurocodes 7 and 8 can be automatically generated. Furthermore, user-defined combinations are also possible and can be saved in the database. DeepEX performs both structural (ACI 318, AISC, EC2 and EC3) and geotechnical checks (anchors pull out resistance, toe embedment, hydraulic heave). Deep excavation design: DeepEX helps you design deep excavations by offering the most comprehensive software in the world. Many clients have performed designs within 25% of the original time required time. Cost estimation: DeepEX is now the only software that offers preliminary cost estimation and quantity take offs. Slope stability: DeepEX also performs slope stability analyses so that you do not have to export data to another package, thus saving you time. Analysis methods: DeepEX is the only software in its category that can analyze a wall with limit-equilibrium or elastoplastic methods. In the elastoplastic analysis, the soil is divided in active and passive non-linear soil springs. In the elastoplastic analysis, the lateral soil pressures depend on the soil properties and the proposed construction stage history. Building Damage Assessment: DeepEX is the only software that can easily assess the damage potential of ajdacent buildings next to an excavation. DeepEX uses thorough methods to estimate potential crack widths and building settlement in three dimensions. The program then accesses for critial building elemens the damage potential as negligible, slight, moderate, severe, or very severe. Design standards: DeepXcav implements a wide range of US and European design standards. These include: AISC, ACI, AASHTO, AS 3600, BS, BS 5950-2000, EC2, EC3, EC7, DIN, DM08, etc. Frame Analysis: DeepEX allows you to create the full frame of your deep excavation, and optimize all members within typically 5 minutes. 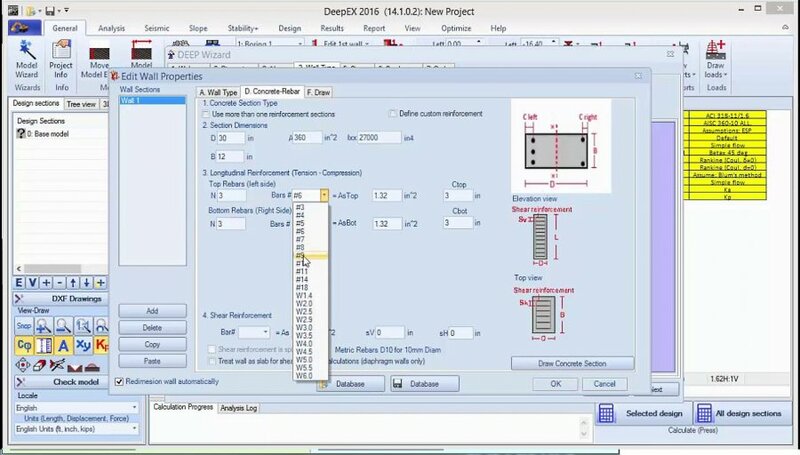 Export to DXF: DeepEX has a new module that allows you to export 80% drawings to DXF. You can export multiple stages and create stage sequencing diagrams. You can also export stages with result diagrams. Pile Supported Abutments: Evaluate pile supported abutments with all pile types for lateral and vertical pile loads, and also examine their effects on an adjacent excavation. * DeepEX download link provides demo version of the software. DeepEX has been rated 5.0 out of 5 points. A total of 2 votes cast and 0 users reviewed the software.